We're now getting to the background stage! 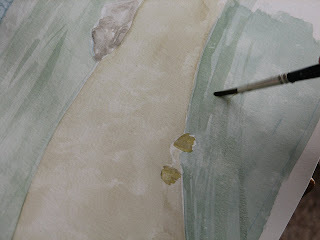 Yesterday my lovely wife Janet turned one of the layouts into a watercolor painting. So now we can start to get a glimpse of how color will factor into the 2D parts. 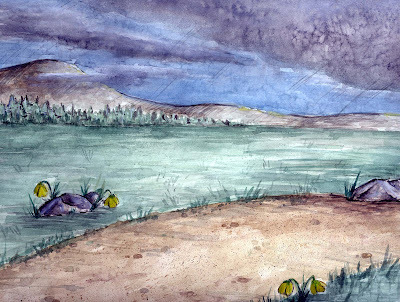 This particular BG is during one of the more somber moments in the middle of the film, when the sky is overcast and cloudy. The elephant simply walks along the road (as happens in many, many, many shots!) and comes to a stop. Perhaps at some point soon I'll try doing a color test and place a frame of the elephant colored-in over top of this.